"How To Raise Healthy Profitable Quails For Meat And Egg Production In Your Own Farm Yard Even If You're Just Starting Out In Quail Farming"
You've been searching around for information on how to raise quails, but you not finding enough guidelines to get you started? Or you have some questions you need answers to when raising quails? Well look no further because I've got the answers to all questions you may have to raising your own healthy quails. Quail is a domestic bird that is about the size of a plump pigeon. When it is in the wild it enjoys living in wooden areas which as forests. It is a brown feathered bird with short tails and is mainly found in Asia, Africa and Europe. The origins of this bird are still debatable but its thought to be around the 11th century and are mentioned in the Old Testament in the holy bible. the Japanese bred this bird in the 11th century with the breed known as Japanese Quail. But today livestock farmers are raising quails as a self-sustaining business. As a farmer you can sell their eggs and meat for passive income since they are nutritious. You too can raise large, healthy, profit-paying quails, if you will merely meet certain clearly defined quail requirements. If you do this, and it's easy, you need never worry about profits, you are sure to succeed. You don't need that much capital to start raising quails, they are low cost birds hence their feed cost less as well. People now prefer quail egg over chicken eggs since they are richer in protein, as a result are ideal for commercial production. Consuming the quail egg will enhence healthy living because it contains proportions of proteins, vitamin A, B1 and 2 for healthy dishes. Quails don't seat on their eggs, as a result can lay eggs all year long with a high production rate. Their eggs fetch nice prices in the market especially among tourist due to their unique color as compared to chicken eggs. Quail meat is also very nutritious and taste very nice. This type of meat is very high in demand for quail lovers. Quails unlike some other livestock are adaptable to almost any kind of weather condition. As a result are able to do well in extreme weather conditions. As you see there are lots of benefits as to why one would want to raise their own quails. When done right quail farming can be very rewarding and can bring some good profits as well. But it is very important that you know what you are doing when starting out because you can easily make costly mistakes. If you want simple, easy read information on raising quails and enjoy all the benefits of owning quails, all in one place, finally there's now a complete guide to successful quail farming. If you are searching for an easy livestock to add to your livestock farm then look no further than quail farming. This bird was first domesticated in Asia and belongs to a family of birds called the Phasianidae which also includes other birds like partridges, pheasants and chickens. Quails consume very little feed, don't require that much land and can take good care of themselves without that much attention needed from the farmer. The recent attention given to these birds by farmers is shining new light on these birds since they produce healthy meat and gourmet-quality eggs for your family or for sale. Quails are gentle birds that are easily raised and come in many varieties. They are neighbor friendly, because unlike chicken roosters, the male quail doesn't make that much noise. 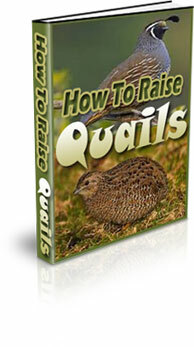 "How To Raise Quails" is a complete ebook that will guide you on how to raise a healthy quails and get the most profit you can from them even if you're an absolute beginner. It's no doubt that a lot of people across the land are getting into quail farming. They are different reasons for this such as the state of the economy, people are looking for more convenient ways of making a living. Whilst others just like having quails as pets in their backyards. Raising your very own quails requires a lot of planning and organization in order to be successful. Costly mistakes have to be avoided because your quails can die and you can lose a lot of money in the process. And since a lot of people are now turning to eating organic foods most farmers are now raising their quails the organic way. Organic meat is healthier than commercially produced meat which is why people like it. It also tastes a lot better. 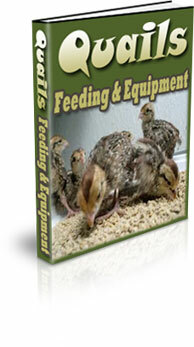 This ebook also covers how to raise your quails the organic way. It's all about successful quail farming. I've got a small yard and wanted to raise some livestock in my backyard, you know, just to make some income since I'm a stay at home mum. So I was browsing through your livestock products on the ideal backyard livestock that will be suitable for my yard. I think raising quails will be the perfect fit. They are small in size thus requiring little land and don't make that make noise unlike chickens. And since the most important thing to me is making some profits, I'm sure I will make lots of profit from selling their eggs and meat. I soon will be making some contact with some butcheries and stores on if I can supply them with quail eggs and meat. I'm rest assured it will be a done deal since I don't know of any farmers who raises quails in my area. I know you like receiving feedback from your customers, so I'm sending you this email to let you know that my quail farming project is on the rise, it's unbeliveble. Six months back I never knew anything about raising quails, infact I had never seen one before. I got interested in quail farming when I was attending some livestock seminar and there was a short presentation on how profitable quails are. Since I'm a real big follower of your livestock products I knew your ebook "How To Raise Quails" will guide me on how to raise healthy profitable quails, and that's what it did. As I write to you may quails are reproducing at a first rate. I'm collecting fresh eggs everyday and my kids enjoy eating them, they've definetely substituted chicken eggs. And last night we had quaii meat for supper and it was super. I'm one happy farmer here and all thanks to your ebook, keep up the good work. I'm a bird farmer and I have various types of birds in my livestock farm. I fell in love with bird farming when I was still young in my parents farm. And I always knew I would own a bird farm of my own when I grow up. Well now I'm old and have various birds in my farm that include of chickens, ducks, geese, ostrich and now quails. When I told my wife that I'll be raising some quails, she said "You Raising What?" Yes quails, she never knew of such a bird. She thought I'm raising all the birds there is to raise. Anyway I wanted to thank you for your detailed book on 'How To Raise Quails' you made things easilier for me. I know how difficult it is to raise birds you know nothing about. You can easily make costly mistakes and watch your whole folk swipe out. But with your ebook I'm sure that won't happen. This guide won't leave you hanging not knowing what to do next. Its a step by step quail farming plan that spells out your next step in plain English, you won't need to look for other information or join any other expensive quail farming training course once you have this guide in your disposal. Quails usually need nutritious food regularly to be healthy, happy and contended. A diet that is high in energy, low in fiber and supplemented with ample of protein is considered ideal and wholesome to ensure the upward and steady growth of quails. Quails can not be called a quail unless it loves its food. Its feeding habits are characterized with rooting and pleading for more food and eating food with a great gusto and relish. However, in spite of your quails being constantly obsessed with the idea of eating food, it does not mean you submit to its obsession. There is a specific and regulated pattern of feeding and eating habits for your quails and before you give your quails that extra morsel of food, ponder again! This is a must have guide for every farmer who wants to proper feed their quails, its a complete ebook to healthy quail farming that will ensure that you feed your quails the right nutrients from a young age. When just beginning in raising quails the first thing you have to prepare is land and housing. Raising quails requires you to build a proper house for them. The housing provides the quails with shade from the hot sun and keeps them warm in the winter. Quails house can be designed using wire, fencing hardware and hay. And house should be well ventilated as well and be kept clean. Believe it or not but quails are clean animals and don't like to defecate their own pens but that doesn't mean you can't help them out. 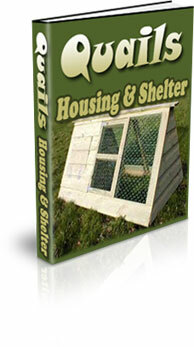 With "Quails Housing And Shelter" you’ll be amazed at how simple and easy it is to proper house your quails. You will get all the different options to housing and the required equipment for quail farming. "How To Raise Quails" retails for $167. But today we are offering it to you for only $29.97. All of the information on raising healthy quails is simple to understand with images to guide you. You'll never find a guide that guides to on raising quails in one ebook. This guide eliminates the time you will spend searching for incomplete information about raising quails. You don't have to purchase a guide on feeding quails alone, then buy yet another guide on raising young quails and keeping your quails healthy separately, that will cost you over $100. Just by making a one time investment of $29.97 you will get all you need to know on raising quails at a cost of the price. One of the most attractive things about quail farming is that its a self-sustainable business opportunity. It only takes quails about six weeks to become adults and once they because adults they can start laying eggs. This means as a farmer you can start seeing quick return on your initial investment. Another advantage of raising quails is that they don't require that much space to move around. So your main concern would be to make sure that your birds are well fed and receive clean water on daily bases. But again quail feed is not costly. So if you are serious about becoming a successful quail farmer, your first step is getting a copy of this guide. Once you get used to how quails are managed you can be sure that you will produce high quality meat plus eggs and make a fortune from the quail farming industry. As you know I'm a full time rancher, raising livestock for profit is what I strive for. I've got my cattle, goats, chickens and llamas bringing me some good return in investment. But raising pigeons is profitable period. It is very surprising that such a small bird can bring so much return in profit. As a farmer you may believe that the larger the livestock the more profits it will bring, but I was wrong. Don't be fooled by the size of quails, they are the ideal livestock to raise if you have little capital, small land and are looking for profits. The meat and eggs are in demand, my produce is taken by restuarants and butchers the moment I put them up on the market. For successful quail farming, it is very important that you know what you are doing so to avoid failures. You have to know how to feed and give proper shelter for your quails. You will have to know how to early notice and treat different types of health matters and diseases that will be of harm to your birds. And when it comes to quail farming this is the only guide that covers every aspect of raising healthy quails. It's a complete guide to being a productive quail farmer. So if you want to raise healthy quails, make sure you have this ebook for guidance and reference! P.S. Not like other livestock, quail are birds that don't get sick easily and will hardly need special care. Although you might never have to call a veterinary specialist, it would be a good idea to have one in your contact list. P.P.S. The demand for quail products is growing because of its health benefits. Quail eggs and meat are low in fat and very high in protein which can assists in the treatment of diseases such as diabetes, liver disease, tuberculosis and hypertension. A lot of consumers are willing to purchase this healty alternative. Yes, Gerard I Too Want To Raise Healthy Quails! I understand that this ebook will help me start a successful quails farm even if I'm an absolute beginner and haven't tried raising birds before. How To Raise Quails - Which will guide me on how to raise profitable quails in my very own farm. I will discover how to care for them and profit from their produce. Quail Feeding And Equipment - This is a complete ebook on how to proper feed my quails and make sure they get enough nutrients to grow healthy and strong. Quail Housing And Shelter - With this ebook I will get guidelines with dimensions on how to build and proper house my quails making sure they are well protected. Get the one and only guide to successful quail farming by adding this guide to your cart below and make a one-time Investment. You will then be redirected to the secure members area where you will get immediate access to download your "How To Raise Quails" ebook plus the two bonus guides. Another copy will be sent to your e-mail inbox.